I'm not going to apologize for all the food on the blog lately. With the kids home, it seems all I'm doing is creating things to fill their stomachs! Next week all the boys leave for camp, so the girls and I will have more time for creativity than cooking. In fact, we're having a week long extravaganza of "foods Dad hates to eat!" It's one of the main reasons I look forward to camp every year...that and the dramatic decrease in my grocery bill. Last week, my friend, Lyn, called to cut me in on a stellar deal for fresh strawberries. I ended up with four heaping berry buckets! I froze one, set one aside to eat and the other two were turned in to jams. I did a large batch of strawberry jam, of course, and a very special batch...of Strawberry Pepper Jam. Pepper Jams and Jellies are a special treat. I had never even heard of sweet pepper jellies until moving to the south. I put off trying them until last year. All I could envision were jams and jellies suitable for peanut butter sandwiches. I had no idea--NONE-- of what I was missing. And now, I'm totally hooked. For this particular pepper jam, I used the hot banana peppers from my garden. The jalapenos haven't come in and I really wanted to use what I had on hand. The banana peppers give it just a touch of heat. . . Just enough to welcome you to the world of pepper jellies. Place the strawberries, minced hot pepper, lemon juice, and pectin into a large saucepan, and bring to a boil over high heat. Make sure the it's a full boil that doesn't go back down when you are stirring. Stir in the sugar until dissolved, return to a boil that doesn't stop while stirring, and cook for 1 minute. Sterilize the jars and lids in boiling water for at least 5 minutes. You may run it through a sterlizing cycle on your dishwasher. Pack the jam into the hot jars, filling the jars to 1/4 inch of the top. I found a tool that measures headspace...it was $1 at Walmart in the canning section. Remove bubbles by inserting a knife along the sides. Wipe the rims of the jars clean with a moist towel. Top with lids, and screw on rings. Process jars in a boiling water bath for 10 minutes. Want to learn more about water bath canning? Here's a great tutorial. Remove the jars from the water and place onto a dishcloth surface, several inches apart. Cool overnight. Once cool check the lids to make sure they sealed. Store in a cool, dark area. This jam sounds really good - love the addition of the hot peppers - sounds REALLY good! Thanks for linking up at The Project Stash! 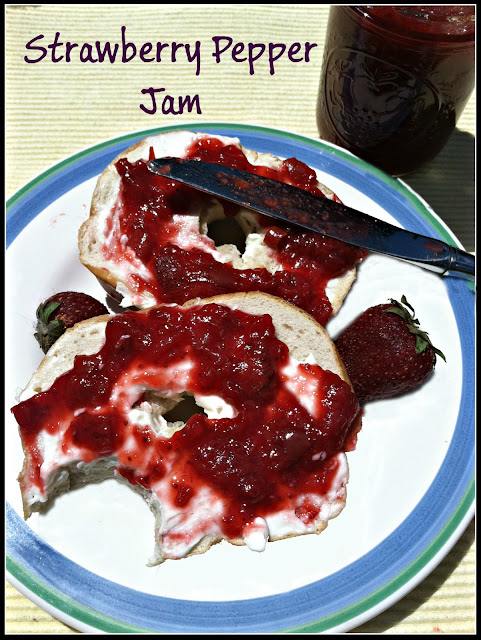 I'll be featuring this recipe tomorrow in a special strawberry post!